When you come to select suitable nutrient mixes, bear in mind that some fertilizers include other micronutrients that are not essential for aquatic plants and need not be added to the aquarium. Some terrestrial plants may require these nutrients for functions that are not present in aquatic plants, such as nitrogen fixation (obtaining nitrogen from the atmosphere). These nutrients include sodium, silicon, iodine, and cobalt. Aquatic plants do not need these nutrients. Many nutrients in the water will bind with oxygen and other elements, becoming too large to pass through the plant's semipermeable membrane. These nutrients are of no use to plants. Nutrients held in the substrate are often stripped of oxygen by anaerobic bacteria. These nutrients then bind with organic chelates found in the substrate, making them easy for plants to assimilate. great deal depending on location. Tap water sources vary in hardness, acidity, and metal toxicity and should be checked before use in a planted aquarium. 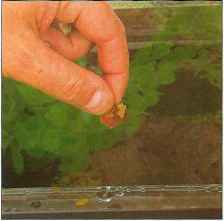 Hard water generally provides more nutrients, and regular small water changes will keep these nutrients at suitable levels for most aquatic plants. The use of tap water should depend on the preferences of the plants in the aquarium and whether they are softwater or hardwater species. In either case, it is usually best to use tap water (rather than reverse-osmosis or rainwater) at least partially as a source of nutrients in a planted aquarium. Depending on where individual plant species occur in nature, they are adapted to the quantities of nutrients in that area. The major factor that affects the quantity of nutrients is water hardness, which, in tap water, should not be confused with pH and acidity/alkalinity. Aquatic plants from hardwater areas require more calcium, magnesium, and potassium than softwater plants, because these elements are present in higher quantities in hard water. On the other hand, softwater plants are well adapted to cope in water with low levels of these nutrients and do not need so much. Some nutrients, including many of the micronutrients, are less available in hard water because they are more likely to form metal oxides and become unavailable as nutrients. 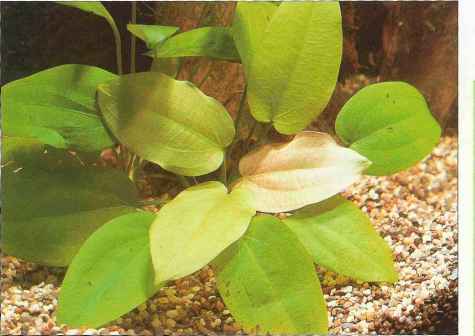 In this case, hardwater plants In the aquarium will require less of these nutrients because they are better adapted to maximize their uptake of them. Chelated nutrients are normally present only in large numbers in the water when an artificial chelate or liquid fertilizer is added. These nutrients are small enough to be taken in by plant leaves above the substrate. continually add carbon dioxide (C02), which is the only nutrient that may be in short supply for softwater plants. It is more difficult to keep hardwater plants in soft water than the other way around, so if you have a mixture of hard and softwater species, it is best to augment a moderately hardwater source with C02. In this mixed environment, the majority of plants should do well. In the aquarium, nutrients can be supplied to plants from a number of sources. Because plants take up nutrients both through their leaves and the roots, nutrients should be made available in the substrate and the water. Micronutrients, or trace elements, are only needed in small amounts and are often present in most tap water supplies. 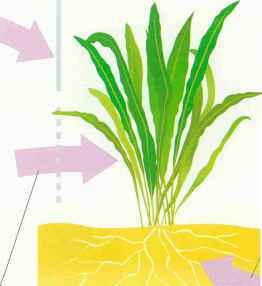 The roots of the plant extend deep into the substrate and release chemicals that aid the assimilation of nutrients. However, some may quickly bond with other elements, making larger molecules that are unavailable to plants. They may also need to be supplied in quantity in the substrate or additionally through liquid fertilizers. Above: Many fish foods are high in nutrient content, and once the food has been broken down, these nutrients are available for plants to use. Many of the nutrients in fish food are likely to have originated in plant matter. Right: Small fish digest food quickly, excreting a large majority of the food's "useful" elements. 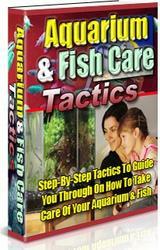 Both fish and plants benefit from the fact that plants use fish waste as a source of fertilization. 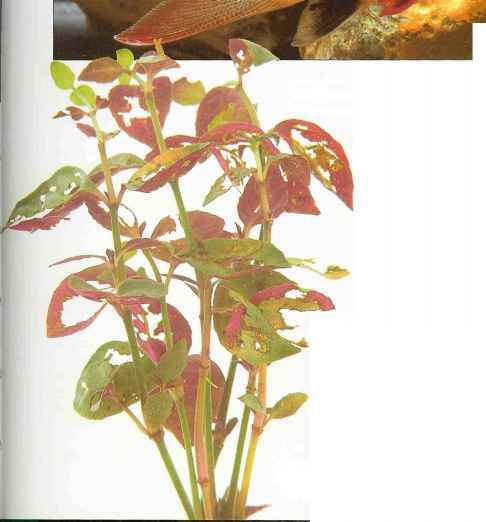 bond with nutrients (see page 67), allowing a large quantity of nutrients to be present, while a slow release reduces the amount of available nutrients. Substrate fertilization can be achieved through the use of proprietary substrate mixes or localized tablet fertilizers.